Cheilanthes arizonica (Arizona lip fern) is apogamous with small 10-in. (25-cm) fronds open in structure with pentagonal blades up to four times pinnate. The innermost pinnules throughout the frond are conspicuously elongate. The species is rare in nature with but a few stations on igneous rocks on the border between Arizona-New Mexico and Mexico and southward to central America. it is not in cultivation but would make a lacy companion to its more densely compact Cheilanthes cousins. 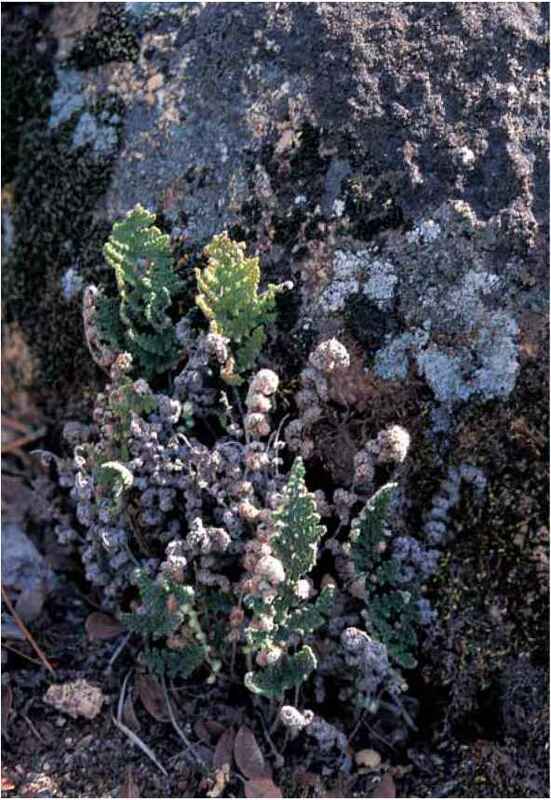 Cheilanthes austrotenuifolia (rock fern) is an apogamous Australian with triangular, emerald-green tripinnate fronds of up to 20 in. (50 cm). The silhouette resembles the more familiar oak fern (Gymnocarpium dryopteris and friends), but the cultural requirements are those of the xerics with special emphasis on rocky, well-drained acid substrates and consistently good light. Cheilanthes bicolor (two colors) is an upright to 18-in. (45-cm) bipinnate species from the Far East including the Himalayas. The ebony stipe is typically longer than the blade and has bicolored scales concentrated at the base. The deltate-lanceolate blade is without scales or hairs on the upper surface, but covered on the lower with a white or greenish-white farina (waxlike coating). Rarely seen, it is in cultivation in Zone 9, in the Bakersfield, California, garden of xeric specialist David Schwartz and can be cultivated in soil with excellent drainage. Cheilanthes clevelandii in the wild in northern California. Cheilanthes pruinata at the University of California Botanical Garden at Berkeley. Cheilanthes chusana (from Zhoushan, China) is a compact 1-ft. (30-cm) evergreen from the fern-rich Japanese, Korean, and Chinese floras. Bipinnate fronds are produced in upright tufts with shiny ebony stipes and, significantly, lack hairs or scales on the blades. The round-edged, false indusia segments are separated with each covering one sorus (or occasionally two sori). The species is probably cold hardy in Zones 8 and 9 (possibly 7) given the traditional precautions for maintaining xerics. 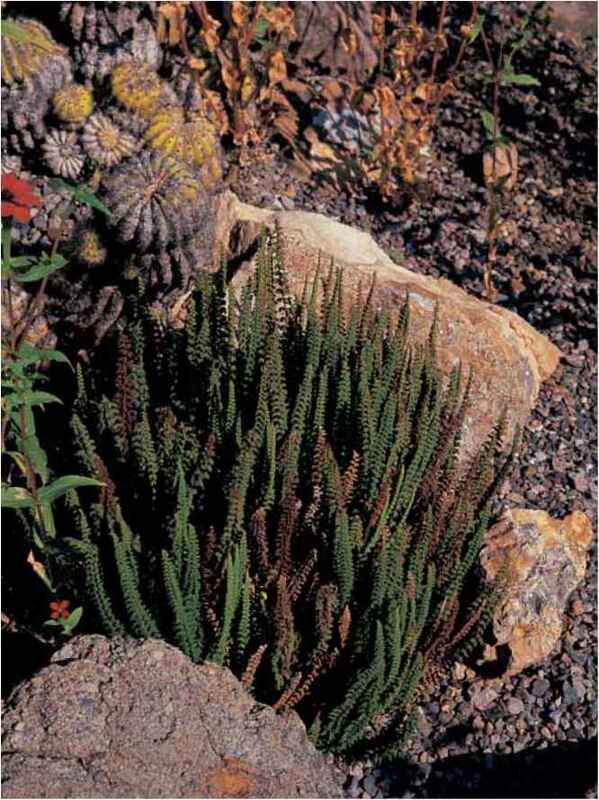 Cheilanthes clevelandii (after Cleveland), from rocky ledges in southernmost California and Mexico (Baja California), is a creeping 6- to 12-in. (15- to 30-cm) species with brown stipes and lanceolate tripinnate to quadripinnate blades. The lower surface carries an abundance of rusty brown hairy scales. The species is suitable for cultivation in Zones 9 to 11. Cheilanthes coriacea (tough leathery) is a North African species that has been successfully cultivated in specialized garden sites in Britain. 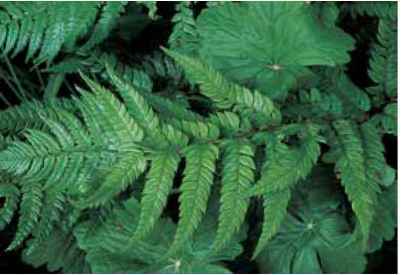 The triangular fronds are a minute 2 to 6 in. (5 to 15 cm) and pinnate-pinnatifid to bipinnate. This is a lovely little specimen in Zones 8 and 9 for close-up viewing in a container with customized xeric compost and the requisite good drainage. Cheilanthes jamaicensis (of Jamaica) is an upright tripinnate evergreen to 12 in. (30 cm). It is a white-haired species for partial sun in Zone 9 or with protection in Zone 8. I grew it for several years, but it really did not take to non-Caribbean life in the Pacific Northwest. Cheilanthes kaulfussii (after Kaulfuss), the glandular lip fern, is a lime-green evergreen with fronds to 16 in. (40 cm). The delicate, horizontal blade is tripinnate-pinnatifid with extended basal pinnae giving it a pentagonal silhouette. Glandular hairs make this easy to recognize by the gummy feel of the foliage. The species is native to acidic rocky habitats from Texas to South America and should be tested in Zones 8 and 9. Apogamous. Cheilanthes myriophylla (many leaves), the beaded lip fern from Mexico and South America, is a triangular evergreen with emerald-green fronds up to 18 in. (45 cm). The blade is quadripinnate with beadlike pinnules and a lower surface resplendent with buff-colored scales. This delicately divided species grows in lightly shaded rocky sites and is suitable for Zone 8 and 9 gardens. It is similar in structure to C. villosa but does not have a hairy-scaly upper frond surface. Cheilanthesparryi (after Parry) snuggles in crevices in assorted substrates in the hillsides and mountains of the southwestern states that border Mexico and indeed in Mexico as well. We first found it outside of Las Vegas, where the odds of finding the fern were about equal to the odds of winning in glitztown. (We were there for the botanizing.) This is a truly fleece-covered, cottony species that captures the eye of the xeric enthusiast with 8-in. (20-cm) puffballs of bipinnate, lanceolate blades. It has not been successfully maintained in the Greater Seattle area, but should be tried in an assortment of exposures in Zones 8 and 9 to introduce it into the civilized world of cultivated ferns. Cheilanthes platychlamys (broad cloaked) is a promising Himalayan introduction that is barely referenced in literature but described in Rickard (2000) thus: "Fronds triangular, pin nate-pinnatifid, powdery white meal scattered on the upper surface, lower surface white all over. No conspicuous hairs or scales." It has ornamental potential as well as collector's appeal, but has not yet been thoroughly tested in the United States. Cheilanthes pruinata (with a white powdery bloom) has extremely narrow, linear evergreen bipinnate to bipinnate-pinnatifid fronds growing in dense upright clumps to 12 in. (30 cm). The innermost pinnules are smaller than adjacent pinnules and the whole is enveloped in russet hairs and scales at maturity. This rare species of altas montañas grows in sheltered rock strata at 14,000 ft. (4200 m) in the Andes from Bolivia and Peru to Argentina and Chile. It should be cold tolerant in Zones 6 to 8, with the ever-present precaution of protection from winter wet. Cheilanthes quadripinnata (with pinnae four times divided) is a promising species from the unmined riches of South Africa. Minute pinnules on broadly triangular blades adorn the deep ebony, wiry structure. In its native habitat at 11,000 ft. (3300 m) elevation, it grows to 10 in. (25 cm) in cool, rocky crevices and almost full sun. Give it protection from excessive wet in rock gardens in Zones 7 to 9. Cheilanthes sieberi (after Franz Sieber, 1789-1849), synonyms C. humilis and C. tenuifolia, is native to sunny and rocky sites in New Zealand and Australia. By nature it is stiffly upright with bipinnate to tripinnate dark green foliage. It should be considered garden worthy in Zone 9 and, with appropriate cautions, in Zone 8. Apogamous. Cheilanthes villosa (villous, shaggy) is an apogamous evergreen from southwestern North America with, as the name implies, a woolly pinnae undercoat of scales in addition to lightly scattered hairs on the frond's upper surface. It is finely divided into tripinnate to quadripinnate segments and worthy of admiration when displayed, with its needs successfully nourished and accommodated, in Zone 9 and, when well tended, in Zone 8. Cheilanthes yavapensis (from Yava, Arizona) is an apoga-mous evergreen believed to be a hybrid between C. lindheimeri and C. covillei. It is similar in appearance to C. wootonii from which it was recently separated botanically. The differences are difficult to determine from field characteristics, but the upper blade surface on C. yavapensis is slightly hairy rather than smooth as in C. wootonii. Gardeners in Zones 8 to 10 can enjoy this fern in a site where it is protected from winter rain and provided with free-draining, gritty soil.